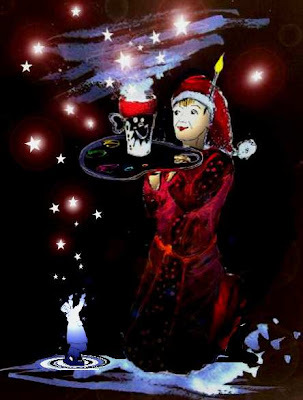 A Painter´s Life on Planet Goodaboom: Merry Christmas to All Bloggers! Merry Christmas to All Bloggers! Kevin has made a Special Christmas Song for all his friends from Cafe Crem, but I am sure, he would be happy to share it with YOU too! Allow me to serve you all a cup of hot Christmas chocolate and to wish you a merry Christmas, and to all your family and friends! I love your Christmas coffee cup. Did you make any prints to sell? If you want some info, please send me per email your own email address. Thank you!